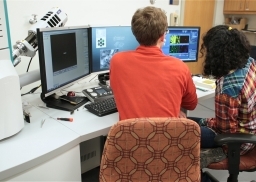 Dan Reed and Sarina Patel, both class of 2014.5, analyze samples of magma from a New Zealand volcano on the College's new scanning electron microscope. Until recently, a scanning electron microscope (SEM) in McCardell Bicentennial Hall let science students view samples at an impressive 2,500 magnification—more than twice the magnification of a typical light-illuminated microscope. That number was eclipsed this year when the College added a new state-of-the-art SEM that can easily reach 150,000 magnification. Purchased with a grant from the George I. Alden Trust, the new SEM occupies a fraction of the space of the old scope and ushers in a new level of research and creative potential for students and faculty. "With this instrument, we can take a chunk of rock, polish it off, put it in, and pull up a spectrum that has little peaks that correspond to the different elements on a periodic table," said David West, professor of geology, whose students have begun using the new device for class and independent research. Previously, West noted, that kind of analysis would have required sending the samples out to a sophisticated lab and waiting a couple of weeks for results. The SEM's extraordinary magnification can be used both for imaging—in which an actual three-dimensional image is transmitted to a monitor—and for detecting chemical composition. The new instrument also has detectors installed to determine elemental composition and crystallographic structure. 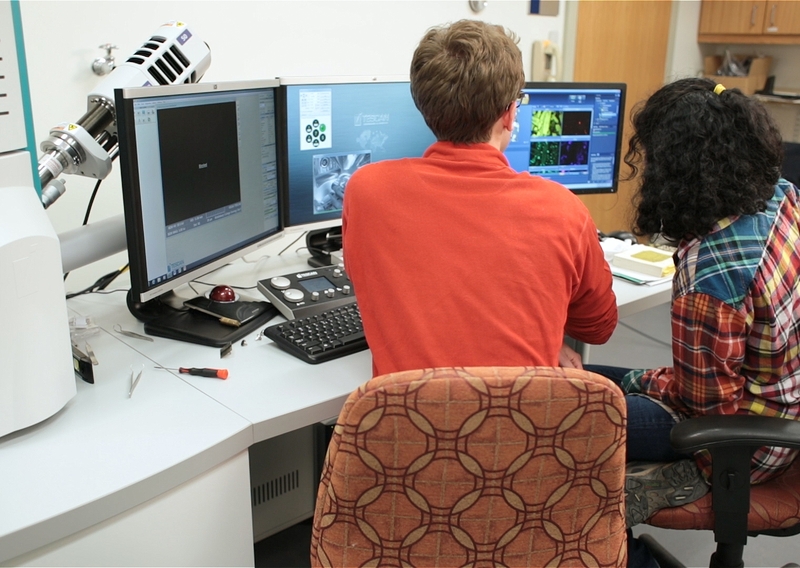 Video: Sarina Patel ’14.5 and Dan Reed ’14.5 talk about how they're using the College's new scanning electron microscope for their senior theses. Sarina Patel ’14.5, a geology major, used the SEM for her senior thesis research on the origins of a volcano in New Zealand. She hopes her analysis will provide more information about how the magma was formed. "I'm using the SEM to look at some of the chemistry of those rocks in greater detail than I could get on pretty much any other piece of equipment we've got available," said Patel. Dan Reed ’14.5, also a geology major, researched how certain rocks in Maine were formed. "You really have to take a look at minerals and mineral chemistry within the rocks, and the only way to do that is using an instrument like this," said Reed. Both students said they've enjoyed easy access to the new scope, a fact they don't take for granted. "It's very rare for undergraduates to have access to an instrument like this," said Reed, "let alone one of this quality." West says that, although geology majors love the SEM's capabilities, he hopes that other departments will also think about ways to use it. "One of the things we'd like to do with this new instrument is to publicize it around campus and try to get more people interested in it and see applications in things like art." Patel agreed. "I mean, if you were an art major and you wanted a different perspective on photography, fifty thousand or one hundred thousand magnification of something is going to give you a unique perspective!" Add a critical point dryer and a sputter coater and the scope will be of great use to biologists. We have the sputter coater and indeed, biologists are already using it!